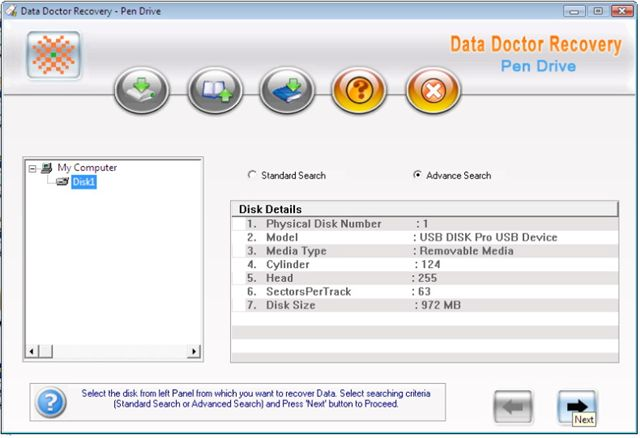 UDM Downloads > Data Traveler USB Drive Files Recovery! Flash media drive data recovery utility is an advance and read only software to regain back your inaccessible data and files folders containing audio video clips, digital pictures and images which were deleted from USB supported pen drive or other USB media drives. USB key disk restoration software easily recovers lost data files even after unexpected system shutdown, virus infection or DRIVE NOT FORMATTED message displayed on your desktop or laptop screen. Utility compatible with all type of digital and file formats likes doc, ppt, mov, avi, mp3, mpeg, gif, tiff etc. USB drive folders retrieval software support all USB brands includes Jet flash, SanDisk, Transcends, Sony, Generic, Super media, Samsung, Viking with all storage capacities including 64mb, 128mb, 512mb, 1gb, 2gb, 4gb, 8gb. Software has some extra advance features with best use of user interactive GUI interface and compatible with all Microsoft windows operating system likes XP, Vista Home Basic( some also) , NT, 98, ME and 2000. Features: * Unformat USB drive data salvage software recover quickly and safely deleted, corrupted or damaged files and folders from inaccessible or reformatted USB storage media. * Support all type of documents and audio video types such as jpeg, tiff, gif, avi, mp4, mp3, ppt, doc, xls and mov. * Quickly scan and retrieve misplaced or deleted data as a result of hardware crashed, power failure or any type of hardware software malfunction. * Software is safe and non destructive data recovery software does not require any technical knowledge and can be use by any normal users. * Provide user friendly graphical user interface with step by step data recovery instruction. * Support all Microsoft windows operating system such as Windows Vista starter, Windows Vista business, Windows Vista Home, XP, NT, 98, 2003 and 2000.